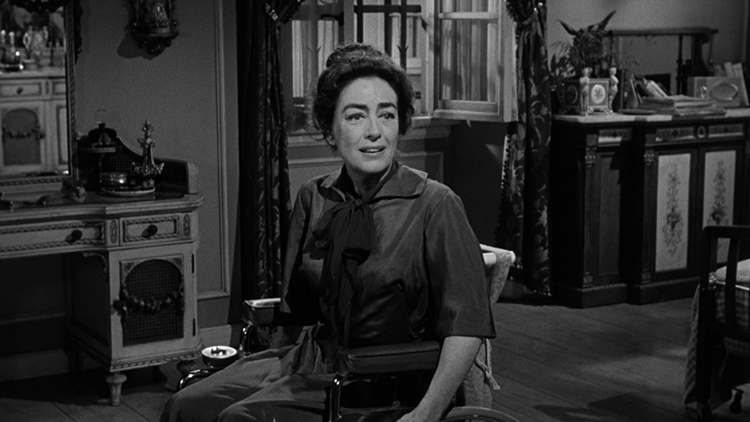 Joan Crawford and Bette Davis had been Hollywood stars forever by the time they filmed WHATEVER HAPPENED TO BABY JANE?. 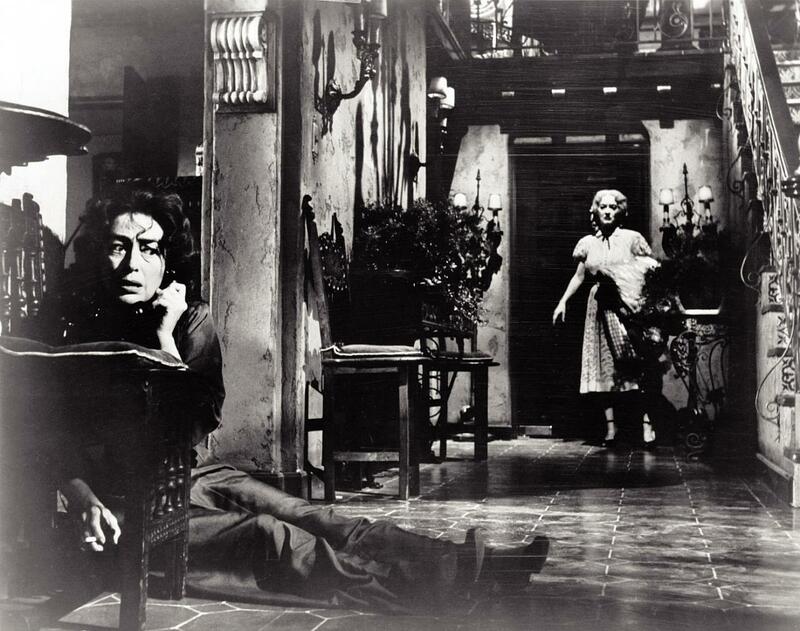 Davis was now 54 years old, Crawford 58, and both stars were definitely on the wane when they teamed for this bizarre Robert Aldrich movie, the first (and arguably best) of what has become known as the “Grand Dame Guignol” (or “psycho-biddy”) genre. Bette is Baby Jane Hudson, a washed-up former vaudeville child star with a fondness for booze, while Joan plays her sister Blanche, a movie star of the 30’s permanently paralyzed in a car accident allegedly caused by Jane. 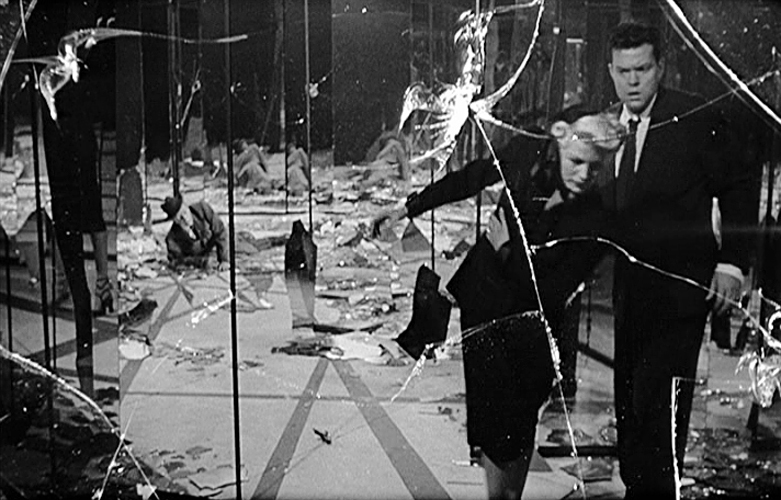 The two live together in a run-down old house, both virtual prisoners trapped in time and their own minds. Blanche wants to sell the old homestead and send Jane away for treatment, but Jane, jealous of her sister’s new-found popularity via her televised old films, descends further into alcoholism and madness, torturing Blanche and keeping her a literal prisoner. Delusional Jane thinks she can revive her old act, going so far as to hire a down-on-his-heels piano player to accompany her. Things quickly degenerate when Jane murders Blanche’s loyal housekeeper Elvira and sinks deeper and deeper into insanity…. 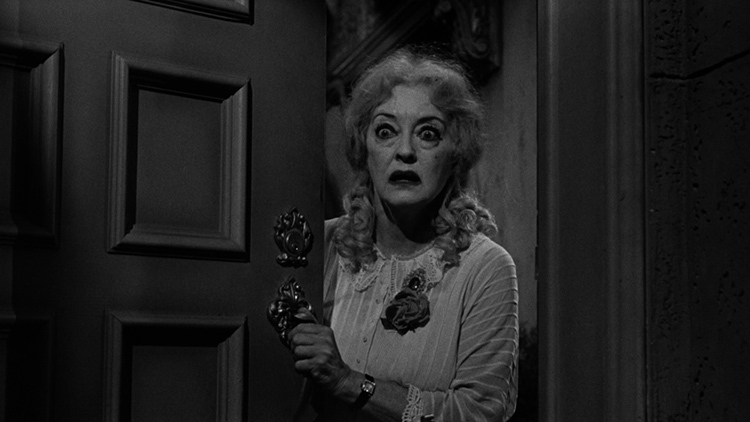 Bette Davis goes gloriously over-the-top as Baby Jane, chewing every piece of scenery with gusto. She’s rude, crude, and vulgar, yet still managers to convey pathos with her Oscar-nominated performance. Joan is a bit more subdued as the victimized Blanche, seemingly angelic and rational, but has her moments of dramatic flourishes. The scene where Jane serves Blanche’s pet canary for lunch is just the first of many shocks to follow (“You know we got rats in the cellar”, cracks Jane, cackling like a madwoman at Blanche’s horror). 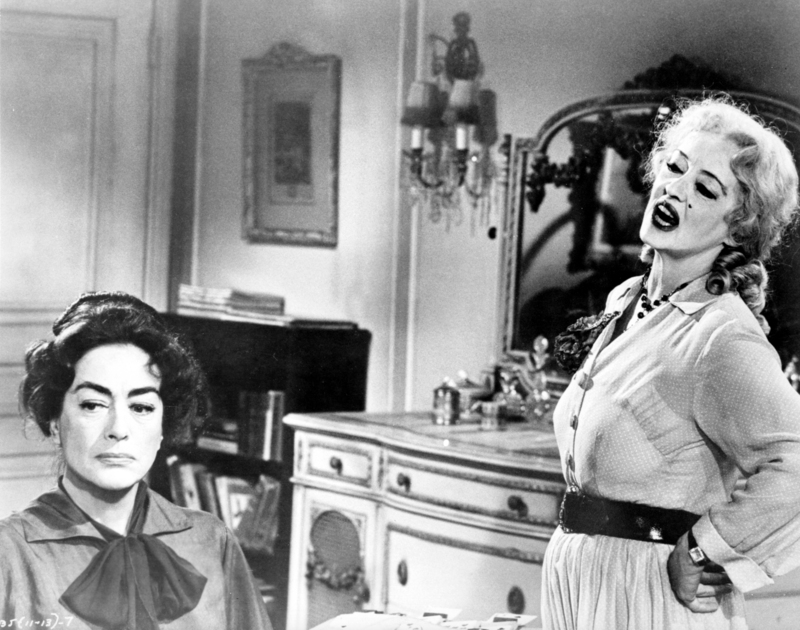 The two old pros offset each other perfectly, though Bette really steals the show here; her croaking rendition of the song “I’ve Written a Letter To Daddy”, dressed in her “Baby Jane” outfit, is an off-key highlight. 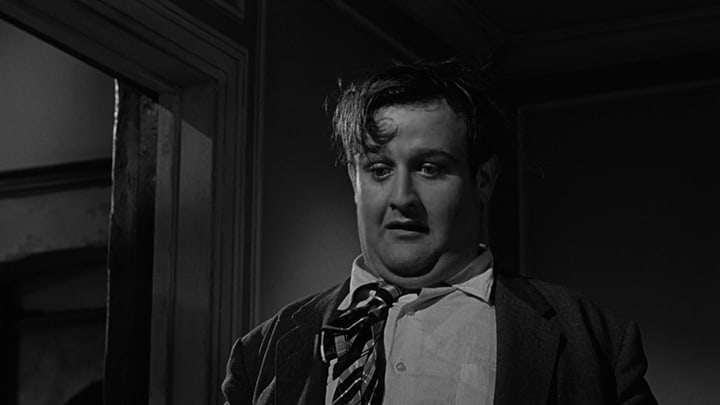 Victor Buono, in his first credited film role, was also Oscar-nominated as Edwin Flagg, the failed musician and mama’s boy who answers Jane’s ad for an accompanist. The part made him an instant in-demand character actor in films like FOUR FOR TEXAS , HUSH… HUSH, SWEET CHARLOTTE (both directed by Aldrich), and BENEATH THE PLANET OF THE APES, not to mention his villainous King Tut on TV’s BATMAN! Veteran Marjorie Bennett plays his overbearing mother, Maidie Norman shines as housekeeper Elvira (who receives a hammer to the head for her troubles), and Anna Lee plays snoopy neighbor Mrs. Bates. Wesley Addy, Murray Alper, Robert Cornthwaite , Bert Freed, B.D. Merrill (Bette’s daughter), Bobs Watson, and Dave Willock lend their Familiar Faces to various smaller roles. Director Aldrich, known up til then for more macho fare like KISS ME DEADLY and THE BIG KNIFE, took a chance with BABY JANE, and scored not only a huge hit, but created an entirely new genre in the process. Soon the market was flooded with “Older Women Doing Horror”: there was LADY IN A CAGE (Olivia de Havilland, Ann Southern), THE NIGHT WALKER (Barbara Stanwyck), DIE! DIE! MY DARLING! (Tallulah Bankhead), WHAT EVER HAPPENED TO AUNT ALICE (Geraldine Page, Ruth Gordon), SAVAGE INTRUDER (Miriam Hopkins), WHAT’S THE MATTER WITH HELEN? (Debbie Reynolds, Shelley Winters), and a slew of other psycho-biddies. 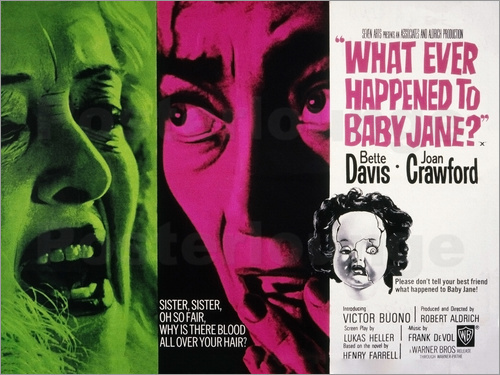 But WHAT EVER HAPPENED TO BABY JANE was the first, and stands severed head and shoulders above the rest. Oh this is one of my all time favorites! Love crazy Bette Davis! Me too, she’s way over the top, and at her best! I think so too! How ironic that Joan plays the stable one! Hope you see it soon, it’s a classic! Completely over the top in every way, but I still love it! 🙂 It does get a bit grim and dark as it goes on though. Both Bette and Joan are terrific here. Bette often gets all the acclaim for her performance, but I think Joan is equally good and she has the more subtle role to play. Great review, Gary. I saw this as a kid, forgotten so much of the plot details, but your post has reminded me that I… need… to… re-watch…this… again! Thanks.